Jane Satterfield's poetry has recently appeared in Notre Dame Review, The Massachusetts Review, The Antioch Review, The Journal, Bellingham Review, and Elixir. Her first collection of poems, Shepherdess with an Automatic (2000), received the Towson University Prize for Literature. Among her other awards are the John Atherton Scholarship in Poetry from Bread Loaf Writers' Conference, a Walter E. Dakin Fellowship from the Sewanee Writers' Conference, and fellowships in poetry from the Maryland State Arts Council and England's Arvon Centre. 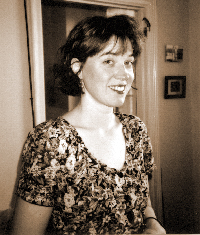 For her nonfiction, Satterfield has received a fellowship for the Virginia Center for the Creative Arts, the Heekin Foundation's Cuchulain Prize for Rhetoric in the Essay, and the John Guyon Award in Literary Nonfiction from Crab Orchard Review for chapters of Motherland, a manuscript in progress. Satterfield teaches at Loyola College in Maryland and serves as staff poetry reviewer for The Antioch Review.